We had a great trip and operated for 5 days. We performed 10 spine cases and 10 ortho trauma cases. Our goal was not volume but to teach and provide the tools for the local surgeons to be successful. We are seeing an impact in a fairly short time. On my first trip to Mulago in the summer of 2008, they were only allowed to do spine cases 1-2 times per month due to a lack of implants and O.R. space. When I returned, we opened the new Spine O.R. (they had been working on it for over two years but made no progress until I told them I was returning again in January, 2009). In 2008, they did 38 spine cases and 8 were instrumented. In 2009, they did 137 spine cases and 38 were instrumented. Suddenly the residents are seeing more cases and are expressing interest in spine. Several want to do fellowships. The people in Uganda are friendly, dedicated to family, and resourceful with limited resources. Why do doctors come to Uganda? For the relationships and the impact on Africa. It is the premier teaching program in East Africa. They have residents from Uganda, Congo, Sudan, Kenya, Tanzania, and Ghana. Case examples for our trip included a non-instrumented case of a lady with HIV and a high-grade block on Myelo/CT, worrisome for infection or lymphoma. Laminectomy and excision revealed a fibrotic tumor of the nerve sheath compressing her spinal cord. It was excised and she has some improvement of her myelopathy. The second case is a young man who fell into a ditch while tending his cattle. He suffered a fracture dislocation of the thoracic spine and a humerus fracture. He is paraplegic and we felt the best option for rehab was to reduce the spine, stabilize, and then fix the humerus. He was able to sit up the first post-op day for the first time in a month. 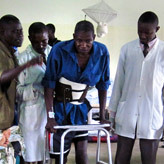 When patients are admitted, the entire family moves into the ward. Nursing is about 1 per 80 patients. The family members help with nursing care, bathing, laundry, and preparing food. Summary by William J Richardson, M.D.